Jet Airways also informed the exchange on grounding additional six aircraft due to non-payment of amounts outstanding to lessors under their respective lease agreements. 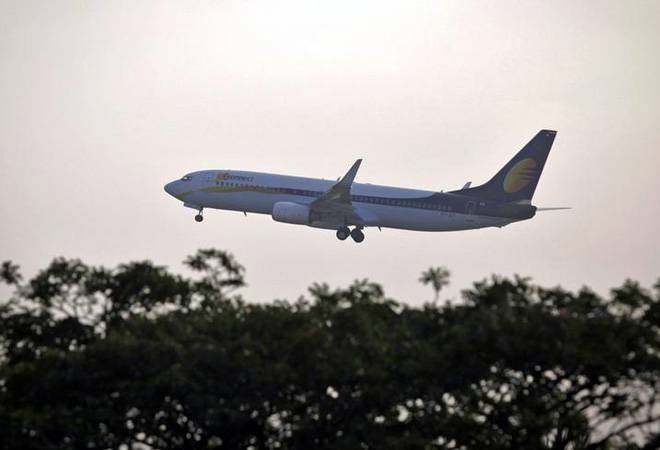 Shares of cash-strapped Jet Airways continued losing streak on Wednesday, falling over 6 per cent, after media report suggested that its strategic partner Etihad may sell stake in the company. The company also informed the exchange on grounding additional six aircraft due to non-payment of amounts outstanding to lessors under their respective lease agreements. After opening lower with a gap down at 5.83 per cent, the stock further plunged down 6.6 percent to the day's low of Rs. 213.95. Todays low is 50.95 points closer to the stock's 52-week low of Rs. 163 recorded on October 1, 2018. At 2:00 pm IST, the stock was trading at Rs. 218.20, 4.7 per cent below yesterday's close of Rs. 229. in the trading platforms. The price band has been quoted between Rs. 251.95 to Rs.206.15 for today's trade. The exchange also seeked clarification from the company regarding a reports quoting "Etihad may exit Jet Airways by selling 24% stake to SBI".The reply is awaited, it added. Etihad has offered SBI to take over its liabilities in the form of a guarantee for Jet's loan from HSBC Dubai and also offered its 50.1 per cent stake in Jet Privilege to SBI, the report added. Jet-Airways' stock has been losing for the last 2 days and has fallen 8.31 per cent in the period. It has underperformed the sector by 7.69 per cent and the share runs below 5, 20, 50, 100 and 200-day moving average. The number of FII holdings have also decreased from 57 to 37 in the stock, as of December 2018. Not only that, historically the price movement of Jet-Airways have been continuously delivering negative returns, amounting to a fall of 67 per cent in one year, 10 per cent in six months, 5.5 per cent in one month and more than 11 per cent in one week.